To win an amount of money in this scratch game the player has to find it three times under the scratch area. 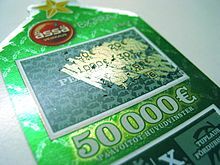 A scratchcard (called a scratch off, scratch ticket, scratcher, scratchie, scratch-it, scratch game, scratch-and-win, instant game or instant lottery in different places) is a small card, often made of thin paper-based card for competitions and plastic to conceal PINs, where one or more areas contain concealed information which can be revealed by scratching off an opaque covering. Applications include cards sold for gambling (especially lottery games and quizzes), free-of-charge cards for quizzes, fraudulent free cards encouraging calls to premium rate phone services, and to conceal confidential information such as PINs for telephone calling cards and other prepaid services. In some cases the entire scratchable area needs to be scratched to see whether a prize has been won - the card is printed either to be a winner or not - or to reveal the secret code; the result does not depend upon what portions are scratched off. In other cases, some but not all areas have to be scratched; this may apply in a quiz, where the area corresponding to the right answer is scratched, or in some gambling applications where, depending on which areas are scratched, the card wins or loses. In these cases the card becomes invalid if too many areas are scratched. After losing one can scratch all areas to see if, how, and what one could have won with this card. The scratchcard itself is simple: a card made of paper-based card, or plastic, with hidden information printed on it, covered by an opaque substance (usually latex) that can be scratched off relatively easily, while resistant to normal abrasion. The original game tickets were produced using manual randomization techniques. In 1974 the American company Scientific Games Corporation led by scientist John Koza and retail promotions specialist Daniel Bower produced the first computer-generated instant lottery game. In 1987, Astro-Med, Inc. of West Warwick, Rhode Island, received the U.S. Patent for the instant scratch-off lottery ticket. Simple prize scratch cards require the player, for example, to scratch off three (or more) areas hiding numbers, symbols, etc. If all the items revealed are the same, a prize has been won. More complicated scratchcards have several different ways to win on one card. Other scratchcards involve matching symbols, pictures or words, or are adaptations of popular (card-)games such as blackjack, poker or Monopoly. Games are also tied to popular themes such as Harley Davidson, Major League Baseball, NASCAR, the National Hockey League, Marvel Comics and FIFA World Cup. There are currently two major manufacturers of game tickets: Scientific Games Corporation, with production facilities in the USA, Chile, UK, Germany, Canada, Brazil and Australia; and Pollard Banknote, with production facilities in the USA and Canada. There are several other smaller manufacturers in North America, Europe and Asia. Scratchcards are a very popular form of gambling due to their low cost and the opportunity to win instantly, as opposed to waiting for a drawing like many lotteries. There is a trend towards more expensive scratchcards (20-30 USD) that have prizes in the millions of dollars. However, many such "instant" tickets sold in the US, especially in Massachusetts and New York, do not pay top prizes "instantly," but rather over many years, with no cash option. The popularity of lottery scratchcards has been increasing at a greater rate than any other form of lottery. In the 21st century there have been attempts to increase the odds on finding a prize-winning card based on statistics, by tracking the amount of prize money won and cards sold to calculate accurate current odds. There have been a number of instances where a series of cards are still available although all major prizes have been won. Some lotteries make this information available to all free of charge to help promote their games Hypothetically, large early payouts may exceed ultimate sales before expiration of the game card series. However, the low odds of winning - typically from less than 1 in 5 to about 1 in 2.5 - and players who buy cards unaware of the low return, offset these losses, so the lottery still makes a profit. Many state lotteries also run a second-chance sweepstakes in conjunction with the retail sale of state lottery scratch cards in an effort to increase consumer demand for scratch cards and to help control the litter problems associated with the improper disposal of non-winning lottery tickets. As lottery tickets and scratch cards are considered in the United States to be bearer instruments under the Uniform Commercial Code, these scratch card promotions can be entered with non-winning tickets that are picked up as litter. However, the details associated with actually winning a second-chance lottery scratcher (at least as it pertains to California) have not been defined or elaborated in any meaningful, useful, or clearly understood way. Break Opens, also known as breakopens, break open cards, strip tickets, nevada tickets or in some Bingo Halls as "pickles" are lottery or bingo cards on which there are concealed letters, numbers, or symbols that have been predetermined as winners. The cards are often made of cardboard and contain perforated cover window tabs, behind which the combinations are printed. The purchaser must "break open" the card, or pull up the pull-tabs, to see the information printed within, and then must confirm with winning combinations printed on the back of the card, various cards may have come from the printer highlighted as winning under the tabs. The winning combination will be highlighted, making the identification of winning tickets easier. By around 2010 online versions of virtual "scratchcard" (not physical cards) gambling games which utilized Macromedia Flash and Java to simulate scratching a card on a computer were available. Virtual cards could be bought, and prizes collected, over an Internet connection. A widespread misuse of scratchcards is the free-of-charge distribution of cards offering a range of prizes, ranging from extremely low-value to very desirable; for example from time-limited discount vouchers redeemable only through a specified agent to cars. Cards always reveal that a prize has been won, but the nature and value of the prize can only be determined by phoning a premium rate telephone claim line costing a significant sum per minute. Calls to this number are designed by the promoter always to take several minutes, and the prize won is, in reality, always of far less value than the cost of the call, and usually not worth claiming. Regulatory authorities for telephone services have been taking action against such schemes, issuing warnings and large fines. Scratchcards can also be used to distribute confidential information, without any element of chance or skill. A common example is the phone card sold for a price which provides specified phone call usage. The card itself, unlike a credit card, has no function in itself; it is simply a vehicle to inform the purchaser confidentially of the PIN required to make the phone calls paid for.